Streamlabs is starting 2018 off strong with one of its biggest product releases yet: Streamlabs OBS. 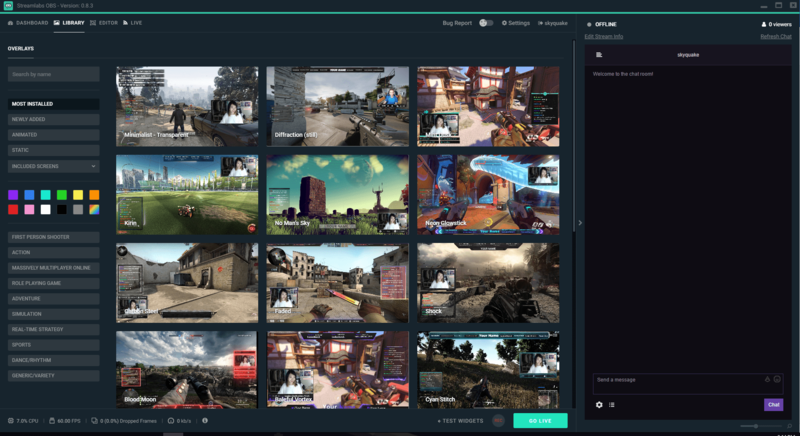 In a livestream on their Twitch channel on Thursday night, the Streamlabs developers announced the newest free livestreaming software is currently in Open Beta. The program acts as an all-in-one resource application for your broadcasts and is already shaping up to be one of the best streaming tools currently available to streamers. Powered by the core OBS engine (but standalone from the OBS program), Streamlabs OBS (humorously nicknamed SLOBS by the developers) contains all the tools you’ll need to have your streams run as smoothly as possible! 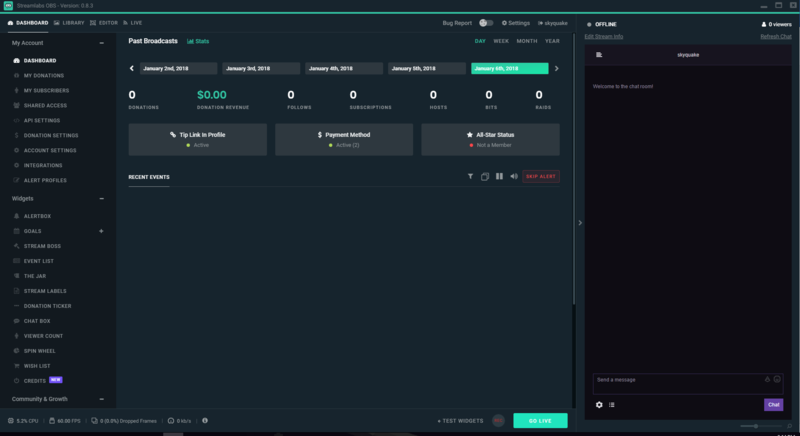 The Dashboard that you’d find by going to the Streamlabs website, you can change your account settings like what Follower, Donation, and Subscription alerts appear, Widgets to add to your overlay, Twitch Extension settings, and stream statistics. Now you can tweak your settings on the fly, making it easier to edit and refine your streaming experience for you and your audience at any moment on-stream or off. A brand new feature to Streamlabs, an enormous library of free themes and overlays has been added for you to use! With nearly 200 overlays including 3000+ designs from over 250 artists, the Overlay Library offers a great way to express yourself and your channel. Webcam borders, Stream Starting/Ending/Be Right Back screens, and chat boxes are just a few of the options you have to design your scenes. OBS veterans will immediately recognize the Scene Editor from previous versions of the program. Here, you can add and edit Scenes, Sources like overlays and widgets, and organize Scene Collections. You can also edit and adjust settings for your Audio sources in the built-in Mixer to perfect every single sound in your broadcast. The Live section is your go-to hub during your broadcast. Here, you’ll find all of your scene choices for easy scene switching if you do not have hotkeys set, your audio Mixer, a live preview of your stream’s video, and the Recent Events window (identical to the previous StreamLabels application) to show every new Follower, Donation, Subscription, Cheer, Host, and Raid that comes your way. Available at all times, the Chat Box and Stream Status bar are readily available for you to use regardless of where you are in the program. The Chat Box allows you to read the chat as well as see (or hide) your viewer count and use the Edit Stream Info box to change your title and game as you go live. The bottom of the program shows your CPU% Usage, current FPS, Dropped Frames and current bitrate. From there, you can go live at any time, test your stream alerts or start recording video, each with the click of a button. Other notable features include a new addition called Face Masks which trigger Snapchat-like face filters through donations and subscriptions as part of a new Alerts system as well as improved game-specific video encoding. There’s a lot to explore and experiment on with Streamlabs OBS with more features already being considered for future patches and updates. As you test SLOBS out, be sure to think outside of the box and test different settings or styles to see what best fits your channel! SLOBS is currently in Open Beta and is available to download here. 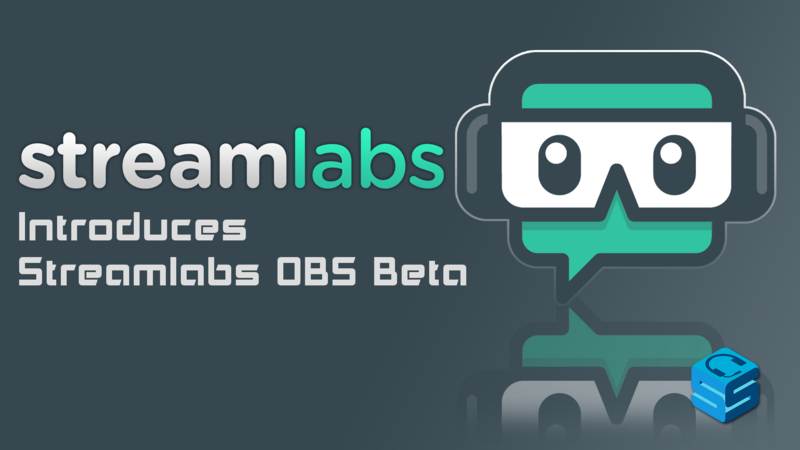 Be sure to check out our official review of Streamlabs OBS at a later date where we’ll go more in-depth with all of its features as the program approaches its official release!